I tagged Kikkan, pulling my arms above my head and gliding straight to protect myself and my poles from any tangles or crashes. Turning a 180 around the fence surrounding the pit crews, I was still gliding towards Jason and Marek, our techs, when I leaned down and unclipped my bindings, hopping off my skis as they were still moving, jumping right into a jog. They each caught a ski and immediately clamped them to the bench, furiously re-applying powder and brushing them out in under 2 minutes as Kikkan skied her lap. It was an incredibly efficient system, the pair of them working seamlessly as a team. I loved the little details of how the team worked together, fitting all the moving parts into place like cogs on a watch without missing a single beat. Getting the tag from Kikkan! Every time I came into the pits, that was our routine – I’d unclip and jump off my skis before I’d even stopped moving, and go right into a jog to shake my legs out. I loved it so much I actually giggled. This was arguably the most important race of my life, but somehow amidst all the craziness, I was having FUN. There have only been a few times in my life when I’ve felt unstoppable, like nothing could possibly go wrong that day. This was one of those times. Don’t let the ear-to-ear grin fool you, though. When I am smiling and bouncing up and down is also when I’m at my most dangerous. I’m just happy enough to be able to will myself to suffer the way nobody else can. I guess I could back up a little bit. The team sprint prep started…well…technically, it started years and years ago because in our sport, you need thousands of hours of training to build up that fitness base. But for the sake of your sanity, let’s jump in at the day before the team sprint. The coaches named the team only a few days out, and that’s a really hard process for everyone. 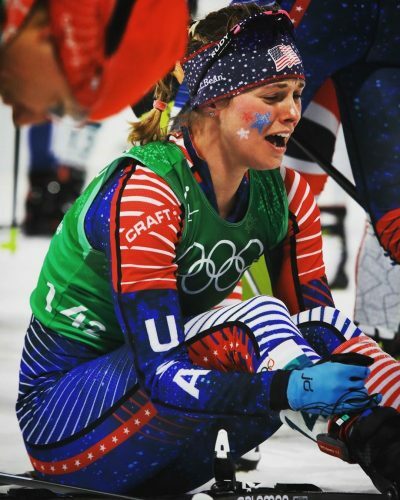 The Olympics bring so much inspiration and emotion, and with that emotion comes absolute heartbreak in unexpected places. 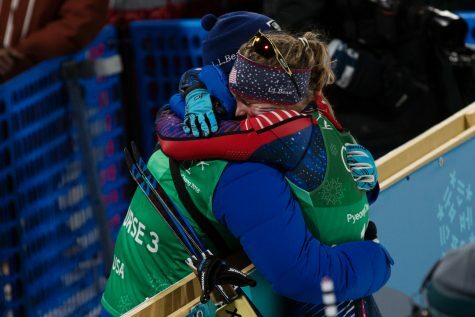 I love and care about my teammates the way I do with my own sister, and before this story goes any further it needs to be said that Sadie Bjornsen is an absolute champion. As first alternate she handled the heartbreak with more grace and poise than many people would, and she was so supportive throughout the entire process. There were so many girls on this team who could have skied those legs with equal finesse, tactics and strength, and it’s important to me that you all know that. 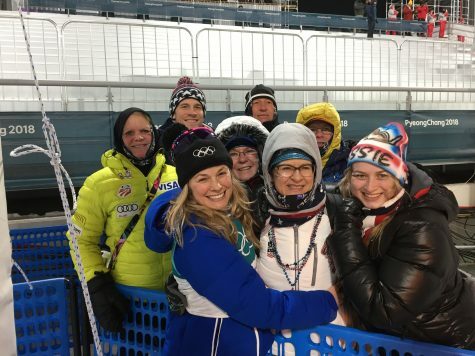 Because the most important legs of the relay aren’t the ones skiing on the snow – it’s the teammates who are cheering on the side of the fence, ready to tear the boards off, cheering in absolute support of the team effort. 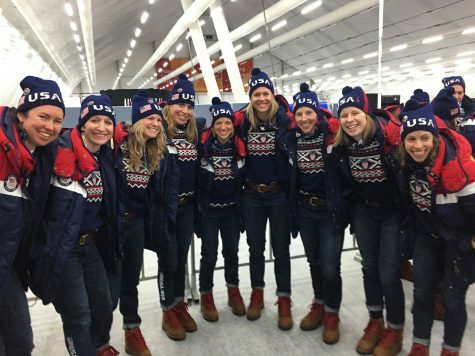 The girls, ready to march in Opening Ceremonies. Keeping the vibe positive and happy from day one! 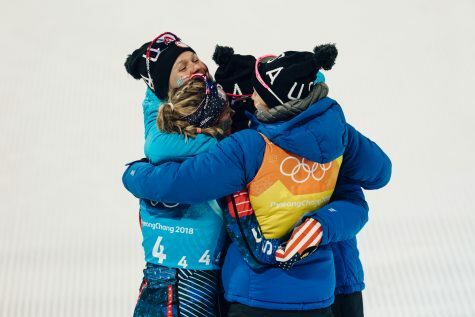 We’ve always said that any medal we win – whether it’s a team event or an individual one – would belong to the entire team, because nobody ever accomplishes anything alone in life. It’s taken years of every member of this team committing to the team goals, coming to training camps and pushing each other through grueling training sessions. Everyone has bought into the team fully, knowing that they’re working for something bigger than themselves. I know my teammates have my back the way I have theirs, and it’s ridiculous that the medal stand isn’t large enough to bring up all the people that should be up there with us. So the day before the team sprint, we did what we do best. 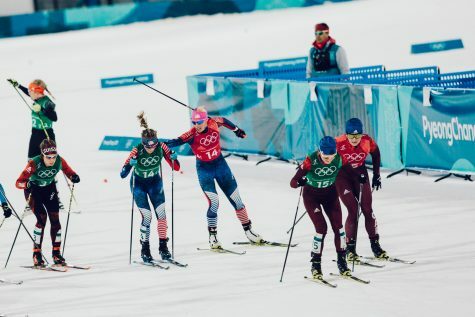 We attacked race prep as a team, doing 2 laps of the course in a team sprint simulation with all the other girls pushing Kikkan and I, challenging us in the tag zone to make a clean and efficient tag among other skiers. Liz wore a balaclava even though it was warm out to make us laugh. She also took off at lightning speed to tag Matt who was her partner (yup, the coaches were in on the team sprint too!) and as she approached he turned to Sadie and I with a straight face and said “well…picture me rolling!” and took off in his classic boots on skate skis. The whole thing was awesome all the way around, and I laughed so hard that it took many of the pre-race nerves away. Not all of them, though. Sadie sporting the relay day face paint and glitter! The day of the team sprint we did what was now the usual routine at the village; sleep in until 10:30am (we were on the night train to adjust to racing so late in the day), have the team pre-race meeting, go for a run on the golf course trails outside the athlete village. Because it’s so hard for me to digest food close to race time, I would just eat an incredibly dense breakfast twice. Kikkan and I watched our favorite “Glee” song mashups and, yes, sang along. Adorkable. On the bus to the venue I turned on my headphones and bumped the Shakira station. Just try listening to the dance beat on that station and not feel happy, I dare you. In my mind, I was running through every possible scenario. 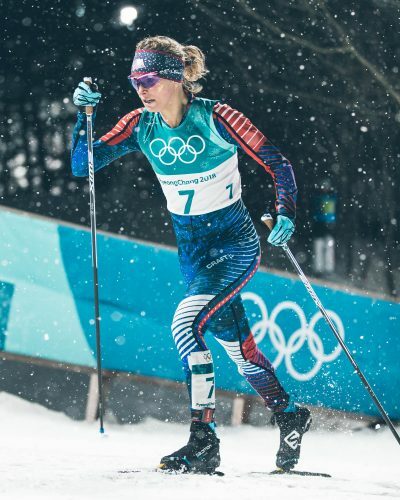 I’d spent a lot of time visualizing the course, how I would ski it, when to switch techniques, what line to take on the downhill and the best places to pass people. By the time I was warming up for the race, I had run through 20 different ways the finals could go down in my mind, so that for every possible situation I’d have a ready response. In team sprinting, you have to be willing to adjust your strategy on the fly. Kikkan and I both knew our respective jobs: as leg 1, her job was to remain in contact with the lead pack at all times. As anchor, my job was to conserve energy at the start and figure out how to maneuver into first place by the finish. We did our usual warmup, and I tested skis with Jason Cork, my coach but also my tech. He’d been working hard with the Salomon reps and narrowed down many pairs of skis to the final 6 pairs for me to test. 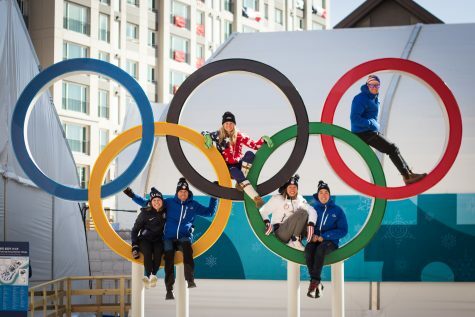 One of the coolest things I think Salomon did for their athletes at the games was that the year before, at the test event in PyeongChang, they tested many different ski grinds and types of construction and base materials. They figured out the best kind of ski for the snow at the venue there, and when I arrived at the Olympics they had new skate and classic skis at our cabin that were made just for me, for that specific race. Just another amazing example of just how much hard work from so many different people lead up to that day! Our wax techs tested so many different combinations of waxes, toppings and applications that it made me head spin hearing about it. And they nailed it! Getting to give Cork a great big hug after the race! In the semifinal, I was absolutely stoked with how things played out. Despite getting the random draw into the second semi which meant much less rest, we were able to move through the heat and conserve as much energy as possible. 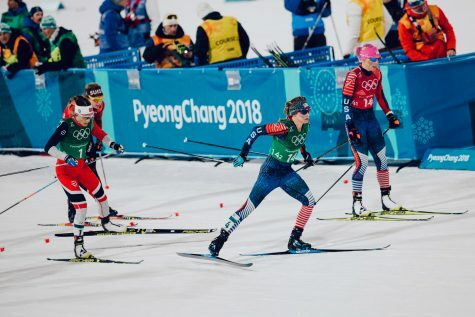 Every lap in the semi was a test run for me; I was taking notes on how our skis stacked up against the field (they were amazing), how other girls were skiing the final downhill, and when and where people were getting tired. We got ready for the final, and nerves were high. I’d also never felt more fired up and ready to just go out there and do what I love! When the gun went off, I was surprised with how chill lap one felt. We were all feeling each other out that first time around. I came jogging over to Grover, our head coach who was in the pit box with us, and told him I thought there were too many people in the lead pack. I said I wanted to start dropping people and I was going to push the pace on lap two, and did he think that was a good idea? Yes. He did. After lap two I tagged Kikkan off and yelled “YOU CAN DO IT KIKS!!! !” I was so excited I had goosebumps all over. We were down to three teams, and I knew as I jogged around ready for the final lap that we were going to get a medal. I knew I was in the best shape of my life and I thought I’m going to go out as hard as I can and try to wear everyone out, because that’s my only chance of winning a sprint out”. Luckily, I wasn’t focused on the fact that I was going up against the current Olympic sprint champion and the reigning World Championship sprint winner. I was just so focused on the task at hand and getting my job done. Kikkan making a good clean tag! On the final big climb, I had a choice to make. I was positioned on the outside and I could either surge ahead to try and be the first one over the top and into the downhill, or I could pull back a tiny bit and be in third position going into the downhill. I decided to pull back. Downhills are one of my biggest strengths (XC only, I am totally helpless and hopeless on alpine skis) and I wanted to be in the draft. I also wanted to be the one doing the passing, as there’s some psychological advantage to being on the hunt verses being the one hunted down. There was a really sketchy moment when all three of us swung wide out of the corner and I almost didn’t make it back onto the course before the v-boards began. Then I had to put my hands up as I almost caught a few pole tips to the face. But I still had a little more energy to burn so as we rounded the corner I gave it everything I had. A lot of people have asked me what I was thinking in those final hundred meters and the truth is, I don’t really remember! I was so in the zone that the only thing I could focus on was each push of my skis, every plant of my poles, and putting every bit of energy and power I had into going forward. I didn’t even hear the crowd! When we got to the line I threw my foot out and out of the corner of my eye I could see Stina lunge, too. I knew I’d gotten across first. I remember feeling kind of weirdly numb, like it wasn’t really happening. When Kikkan tackled me I asked her “did we just win the Olympics?!?! ?” She was screaming and half-crying and that’s when it started to sink in. But the moment I’m always going to remember is when we finally got up and saw our team alongside the boards right at the finish line. Everyone was crying, laughing, screaming…there was no way to really process what had just happened! This moment was the best feeling ever! Getting to hug the team and see the emotion and fierce happiness on everyone’s faces made it finally feel real to me. I have to say, there’s something wickedly wonderful about making grown men cry tears of happiness. The girls from every other team came to hug us as well, which was a really amazing feeling. It was like the whole world was celebrating with us! 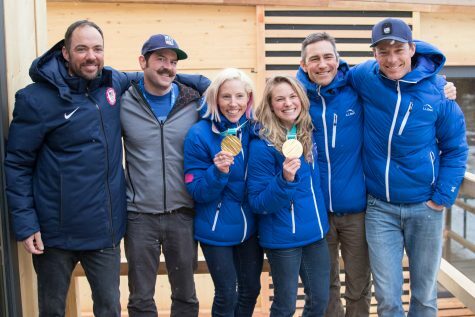 I’ve been lucky enough to make good friends on every team and it’s been so fun to share the ups and downs of ski racing with them, as we all know what each other is experiencing. Getting congrats from the other girls – although clearly, I’m still out of it! My family was there – my Mom, Dad, sister, grandmother, aunt, uncle and my boyfriend Wade. 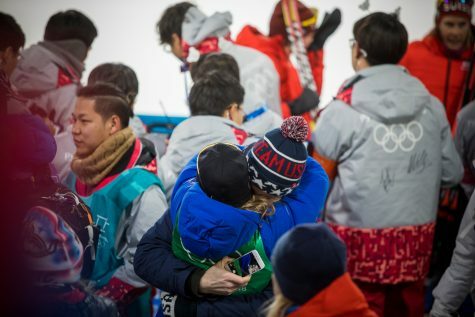 Getting to hug them right after the race was another big flood of emotion! I didn’t even know how to process what was happening. And so began the whirlwind. A photo from earlier in the week of my support crew! Auntie Holly, Wade, Uncle Blair, my Dad, Meme, Mom and Sister. We were pulled one way for the flower ceremony, then the media began. Then anti-doping (I was tested 5 times during the games), then a press conference, then the Today Show and more media. We got home well after midnight! At some point someone sat me down and put a piece of pizza in my hand, which felt like the kindest gesture in the world. Then it was time to still celebrate what we had accomplished, but also figure out how to focus in again for the last event of the games. I wasn’t done racing yet! But wait! 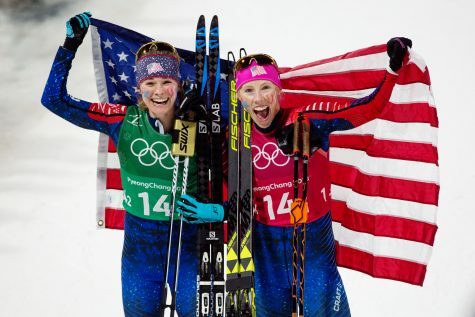 The Olympics weren’t just centered around the team sprint, although of course that was the absolute highlight! 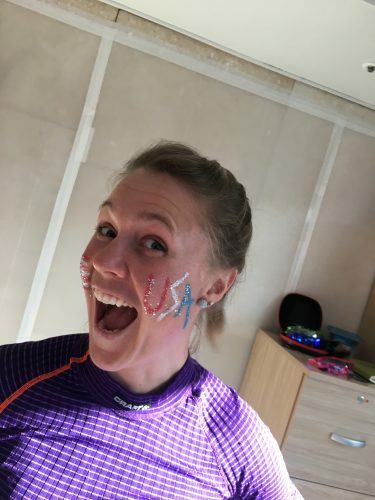 I raced in every single XC event at the games, and when I got curious I added it up and realized I got to race 77 kilometers around those trails. No wonder I feet the need for chocolate every few hours since leaving Korea. 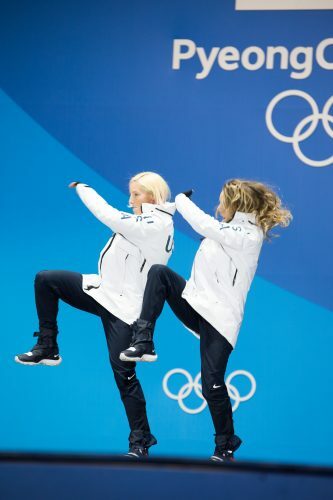 Dancing on the medals stand. Sorry, not sorry for that! It was an ambitious schedule. I was unsure if my body could handle being pushed so hard every 2-4 days. I was unsure if my mind could handle that, as well! I wanted to do it anyways. There wasn’t a single race I wanted to give up! So headed into the Games, the plan was to keep checking in with my body every day, play it race by race, and keep putting everything I had into each race day. My big wall of happy above my bed, filled with good luck pictures and notes from home! 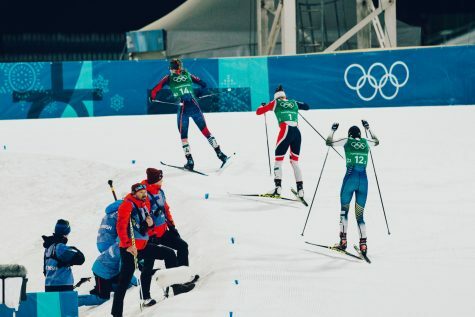 15km Skiathlon: I was so nervous for this one, because it was the first race. But I struggled immensely with cramping in my arms halfway through the skate portion, and couldn’t seem to keep my body and form together no matter how hard I tried! I pushed my hardest and was still happy with 5th place. 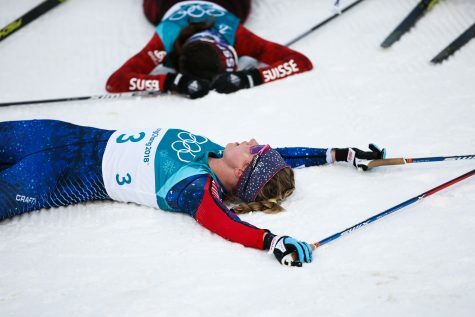 Really, really tired after that skiathlon! Classic Sprint: If you had told me a year ago that I’d make the Olympic classic sprint final, I would have laughed and said “don’t be mean, it’s not nice to make fun of me”. Miraculously, my classic technique came around just in time for a year full of classic sprints! I burned a lot of matches just making it to the final and by the time I came out of the second semi and was starting, I was out of energy. Still, I was psyched to have made it in there! 10km skate: I knew I was fighting for the podium the entire race. And I felt like I was sprinting the entire race! I couldn’t have gotten anything more out of my body, and I knew it when I crossed the finish line. 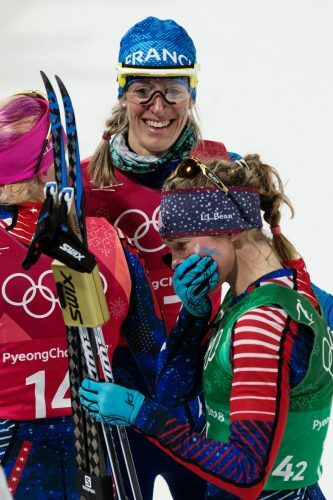 The coolest part was knowing that I was so close to bronze, and skiing virtually the same race as these girls who’ve dominated the sport! It gave me confidence and reassured me that I was on track and skiing well. Which is probably the opposite reaction you’d usually see in the first person off the podium. I’m weird like that. 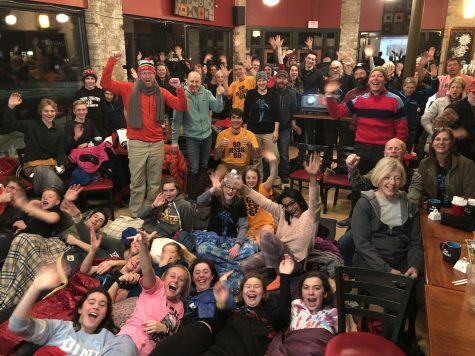 The cheering at the Chilkoot cafe in the middle of the night! I got this after my first race, and it really made my day. 4x5km relay: The morning of the race we went for a team jog, did the team dance that I’d taught everyone this fall on the road, and shared a lot of laughs. The vibe was great and our team chemistry has grown from everyone putting so much of themselves into the team. So even though we were out of the hunt, we all went out charging and fiercely skied our respective relay legs. 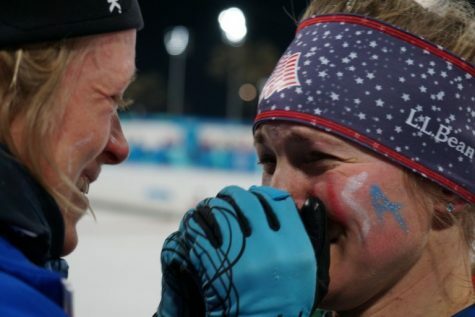 We shared a special moment after I crossed the finish line, and even though we didn’t medal, having the team run out there to huddle up was one of the most meaningful moments of the Games. I won’t tell you what we said – that’s staying between us – but I CAN tell you that not getting what you’ve hoped and dreamed for shows you the true character of a person, and I like what I saw in every member of the team. We still have this championship relay medal down as a big goal to accomplish, and I know we will get there. 30km classic: This one was my hardest day, for sure. 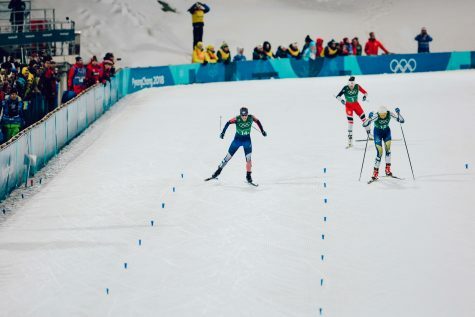 It was my “worst” race of the games, and I’m putting that in quotation marks because I don’t feel like I have the right to complain about being 7th in the world – it just feels wrong. However, a few things that day didn’t work out quite right, and if I had a mulligan I’d take it, because I knew I was in better shape than I was able to show. I crashed early on, rolling my boot over in the slush as we entered the stadium. I had to burn a lot of energy making it back to the front, and as I did that’s when Marit made her move and I just couldn’t hang with the break when it happened. Not for lack of trying, though! I was hammering away in no-man’s land the entire rest of the race, and never backed off. 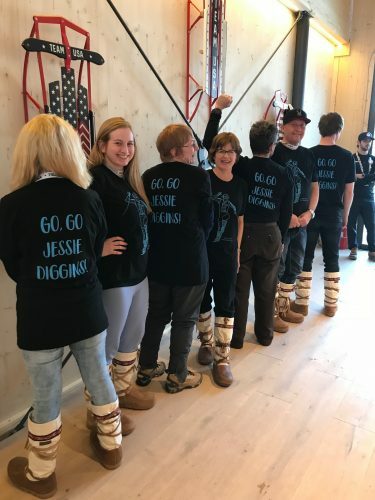 My cheering squad in their “Go Jessie” shirts and Mukluk boots! 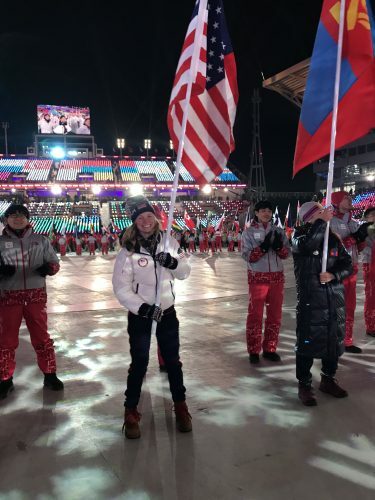 Carrying the Flag in Closing Ceremonies: This was crazy! When I got the phone call saying I’d been voted as flag bearer, my reaction was… “sorry, WHAT?” I thought I was being pranked! 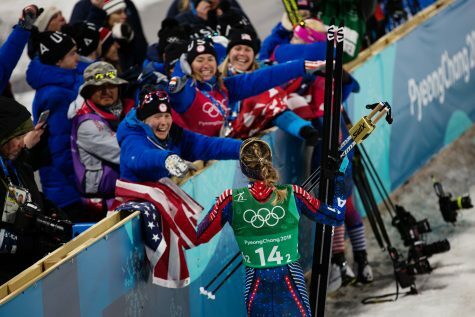 It was humbling and such an honor to hear that the athletes had each had a vote, and they wanted this particular spandex-clad dork to carry the flag. 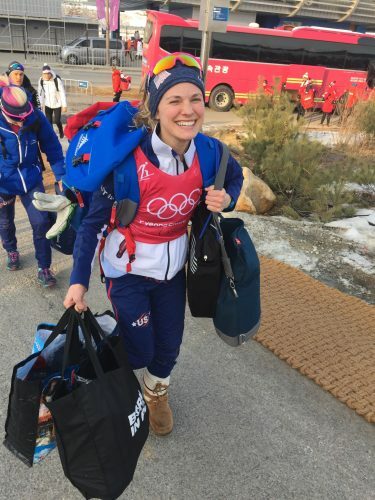 So immediately after picking myself up from the snow after the 30km, I rushed through the media zone, did anti-doping and then turned it around fast to get to the closing ceremony. Getting to wave the flag and see team USA march in and get hugs from my friends (both old friends and new ones I’d made during the games) put a smile on my face that lasted all night! After the Games, Kikkan and I flew to New York City for a whirlwind media tour. 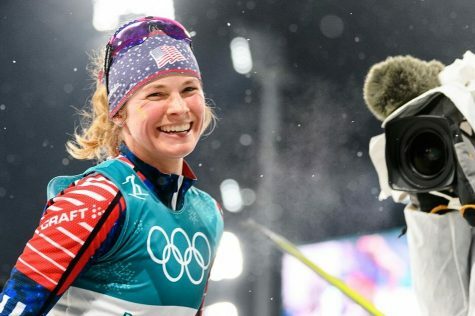 My whole goal was to help grow the sport, and introduce more people to Cross Country skiing in the hopes that we could get a World Cup in the US someday. It wasn’t a mental break, but it was a much-needed rest for my muscles. Throughout the games, my body was slowly but surely breaking down. 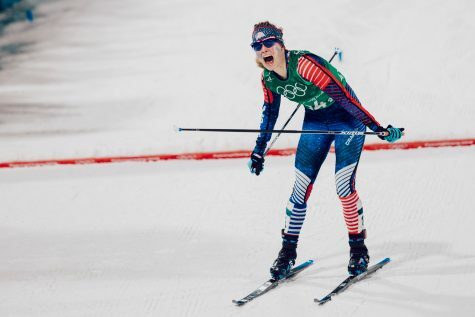 I have a really strong reaction to stress, and what could possibly be stressful about anchoring team USA’s best hope of a XC medal in 42 years? Wink, wink. I did my best to manage all the nerves and pressure of the games by focusing only on the things I could control, and by preparing for each race the way I always do, changing nothing. Although mentally I thought I had it handled, my body knew better, and weird things started happening to it as the games went on. I couldn’t eat enough, no matter how hard I tried. I started waking up at 5am to chug a shake before going back to sleep in order to keep weight on. Finally, I had something in common with the bobsledders! A rash spread across my chest, and skin started falling off in weird patches on my hands. You didn’t need to know that, at all. Sorry. Although a lot of people asked about the band-aids all over my hands…so, now you know. I was convinced at points that my stomach was actually burning a hole in itself because of the post-race stomach aches I’d get when my body was trying to process being pushed so hard while racing at night. The funny thing is, these sorts of things happen to me every single time I’m at a championship event. They stop and fade away literally the day after the last race. This was no different, but at least I knew to expect it and could step back and laugh at the weird things my body was doing as it tried to absorb all the stress I was feeling. Sorry, body. I’ll be taking extra good care of you from now until spring break. It wasn’t just the journalists and various media outlets constantly reminding me that the pressure was on. External pressure you can learn to ignore. I’m bad at it, for sure, but I’ve been getting better at only listening to the expectations I have for myself. But that can also be a problem, because I expect quite a lot from myself! Not in terms of results. I’m smarter than that. I know there are so many things in XC racing that are out of my control, and it would be silly to place any amount of my self worth on a number on the results sheet. What I expect from myself is that I constantly give everything I have and fully commit to each and every training session, team practice, and race. And let’s be honest…that’s how you eventually get the results, anyways. Nobody ever got a medal simply by thinking about a shiny piece of hardware more than anyone else. Since winning said piece of hardware, though, life has been a little bit crazier. I don’t know if I could have prepared for what it would mean to everyone back home, but the absolute coolest part of all of this has been having the chance to share this experience with all of you (well, that…and meeting Jeff Daniels from “Dumb and Dumber”). 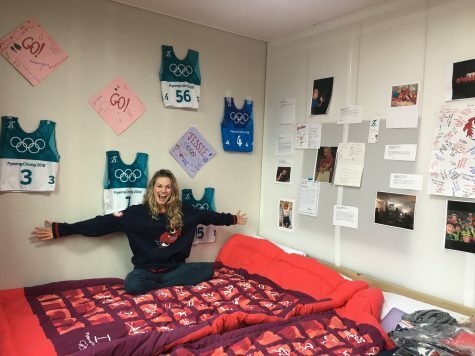 If even one young skier gets inspired by this and decides to stick with sport, commits to their team and enjoys racing, then it’ll have all been worth it. Giving our coaches the medal of Ikkos for their outstanding support! Erik Flora, Jason Cork, Kikkan, Me, Chris Grover, Matt Whitcomb. Let’s make this happen again! The other project I’m the most passionate about is getting the World Cup to come to the United States. As I type this, a team of dedicated people are working and the wheels have been in motion for a year already to try to make this happen! 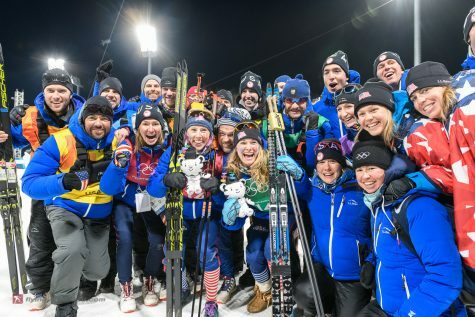 I think this is so incredibly important because I saw the fire in the eyes of all the junior athletes and little kids who were on the side of the race courses at the Canadian World Cups. You could feel the energy in the air, and I still remember the spark I felt getting to see the World Cup live and in person for the first time. It ignites the passion for training hard, working towards your goals and dreaming bigger like nothing else can. And I want that for all our skiers back home, to have that chance to come see it and watch the World’s best fight it out right in front of them. So when that bid happens, if we are given the chance to get this world cup, we need to make it absolutely huge. If we ever want the chance to have another one ever again, we need to show that the US wants this and cares about it, so everyone needs to come see it! I feel like there should be a prize for making it to the end of this blog. Congrats! You got through Jessie’s strange stream-of-consciousness style of writing! More coming later on the end of the World Cup season, but for now, thanks to everyone for the amazing outpouring of support and enthusiasm! It has meant so much to me.